One day, I was riding up near Deception Pass, trying to see if there was action at the Darwin Ranch. On my return, I stopped at a lady friend's cabin. Stormie Waters was doing some prospecting for gold nuggets, and wearing some jade jewellery that was quite fetching. We commenced to making some chin music, and she eventually asked where jade came from. People may refer to jade as a particular shade of green. Indeed, I lack belief that it is just a coincidence that the jade plant is also green. 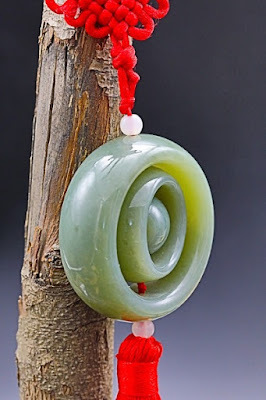 There are different shades of the jade stone that come from two minerals, jadeite and nephrite. The green in jadeite comes from chromium, as pure jadeite is practically white. So, jade can be found in various shades and the two stones have different amounts of hardness. Experiments on those two minerals show that the rock forms under extreme pressures and temperatures that are not happening today. The answer to how jade is formed is found in catastrophic plate tectonics, which provided necessary heat and pressure. (Since jade is popular in New Age beliefs, maybe plate tectonics infused jade with magical properties? Nah.) Secular geologists and creationists agree that plate tectonics happen, but only the creationists have a plausible model for how the whole thing began. Even before it was prized for beauty, this precious stone had another attraction. It is tough, yet easy to shape. So ancient people often carved it into axes, blades, choppers, and hammers. But today its beauty is paramount. Jade was popular not only in ancient Chinese, Japanese, Korean, and other East Asian cultures, but also in the Americas. In Central America, Aztec Indians wore it as a talisman, thinking it had special powers to ease abdominal pain. So where did jade come from? Astonishingly, the biblical Flood cataclysm provided just the right kind of rare, stressful conditions necessary to produce this beautiful gemstone. To read the rest or download the MP3 version, click on "Jade — Beauty Under Pressure". Bonus for those who want to see appallingly bad reasoning from an angry, uneducated atheist about this article, click here.